Marek Kwiek published a paper on „International Research Collaboration and International Research Orientation: Comparative Findings About European Academics” in Journal of Studies in International Education (22(2), May 2018, 136-160). The paper is here. Or at ResearchGate. strong barrier to intra-European research collaboration in the future. The Journal of Studies in International Education (JSIE) http://journals.sagepub.com/home/jsi reaches an extensive international audience. It is the premiere forum for higher education researchers, teachers, policy makers, leaders, managers and administrators, interested in all facets of the internationalization of higher education. JSIE publishes critical scholarly peer reviewed articles from researchers and practitioners in all regions of the world contributing new insights into current and emerging concepts, theories, research and practice in the internationalization of higher education. 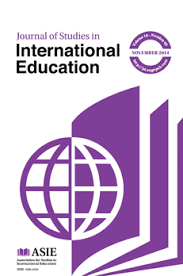 The Journal of Studies in International Education is published on behalf of the European Association for International Education (EAIE) on behalf of the Association for Studies in International Education (ASIE), a group of organizations whose mission is to encourage international education and serious research and publications dealing with this topic. As such, the initial objective of ASIE and the primary focus of its activity is support of the publication of JSIE. It publishes 25-30 papers a year.